Watermelon tourmaline is an interesting multi-colored elbaite variety. Gems are usually fashioned in thin polished slices to display the crystal's concentric color rings. If you use your imagination, the green represents the skin of the watermelon, white makes up the rind, and pink is the sweet fruit. Incredibly, the colors of watermelon tourmaline are 100% natural, a rare occurrence in nature that makes the gem highly collectable. Not all watermelon tourmaline is elbaite tourmaline Na(Li1.5Al1.5)Al6(Si6O18)(BO3)3(OH)3(OH). Dark material might have a birefringence as high as 0.040.Pyroelectric: development of opposite charges at the ends of a tourmaline crystal due to change in temperature. Piezoelectric: development of opposite charges at the ends of a tourmaline crystal when placed under stress. 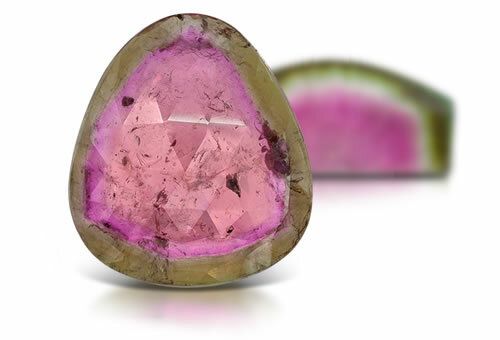 Watermelon tourmaline is Type II clarity stone. Color zoning with pink core and green edges. Stones might contain liquid and gas inclusions that are long and thin, reflective gas-filled fractures and color zoning.